クワーティー《アルファベットの最上列が q, w, e, r, t, y, u, i, o, p の順の通常のキーの配列》. The QWERTY arrangement was intended to reduce the jamming of typebars as they moved to strike ink on paper. From the first six letters on one of the upper rows of such a keyboard. 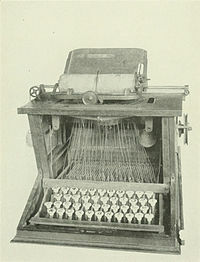 It was the Monotype model D keyboard introduced in 1907 which became the standard for printers, with a "qwerty" typewriter lay and removable keybars which made the keyboard independent of the matrix case arrangement. The older children we came to know had had a great deal of experience with written language, and they certainly had a firm grasp of the alphabetic sequence. They were annoyed with the arrangement of letters on the typewriter keyboard, which begins at the second from the top row and proceeds left to right with the letters, "Q," "W," "E," "R," "T," and "Y." Computer professionals, who refer to this arrangement as the "QWERTY keyboard," have pointed out that, although it originated in order to avoid jam-ups of frequently used keys on the manual typewriter, the QWERTY arrangement is now completely obsolete but apparently here to stay. Third and fourth graders knew only that QWERTY had no logic that they could discern, and, until they developed basic keyboard familiarity, it greatly delayed their attempts at finding the keys they needed. […] The Dvorak typewriter keyboard is, it has been claimed, ergonomically superior to the standard "Qwerty" arrangement. But having settled on the current standard keyboard, largely by historical accident, now manufacturers are supposedly reluctant to produce Dvorak keybboards so long as almost all typists are trained on Qwerty, while typists don't want to train on Dvorak when almost all keyboards are Qwerty. Even the inferior keyboard as a matched choice is superior to failing to coordinate at all. The ‘QWERTY’ layout of keyboards is also a cause for concern. The design means that the fingers of the left hand (the less dominant hand for most Westerners) do 57 per cent of the work in typing English text. RSI symptoms are often found to be more intense in the left hand of keyboard users. The typewriter using separate characters on type bars striking on a cylinder soon dominated the market. Because adjacent striking bars tended to jam when struck rapidly, manufacturers abandoned the alphabetical placement of letters on the keyboard in favor of the left-to-right "qwerty" disposition that takes into account the frequency and sequence of letters in English. ^ Frontispiece of Charles E[dward] Weller (1918) The Early History of the Typewriter , La Porte, Ind. : Chase & Shepard, printers, OCLC 3903756. ^ From George Iles (1912) Leading American Inventors. With Fifteen Portraits and Many Illustrations , New York, N.Y.: Henry Holt and Company, OCLC 493309003.